In October 2016, Trout Unlimited and Prunuske Chatham, Inc. completed a project to restore passage over and around the dam through construction of a roughened ramp and low-gradient side channel. Located, literally, in the backyard of several residential properties—and with many site constraints—this project required years of careful planning and negotiations. The project photo documentary illustrates each step in the construction process. The project was implemented with funding from the NOAA Restoration Center’s Community-based Restoration Program, the CA Department of Fish and Wildlife’s Fisheries Restoration Grant Program and the Sonoma County Water Agency, and would not have been possible without the support and cooperation of neighboring landowners. CA Sea Grant's Russian River Salmon and Steelhead Monitoring Program, who are responsible for pre- and post-project monitoring, are excited to report that numerous coho salmon were observed spawning upstream of the former dam site within weeks of project completion. 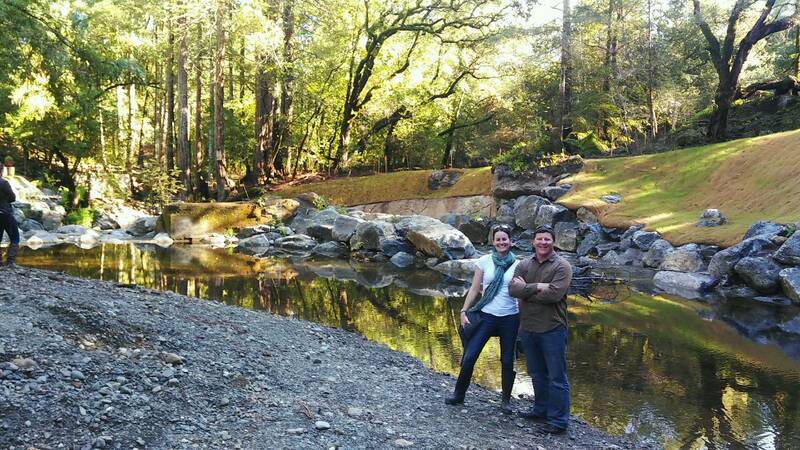 For more about this project see Dam Remediation Spells Victory for Russian RIver Salmon. During winter storm events, juvenile coho salmon and other fish need shelter to protect them from high flows. Historically, large woody debris and inundated floodplains provided refuge but, throughout the Russian River watershed, much of the large wood has been removed from the channel over several decades and channelization and incision has caused some streams to be cut-off from their historic floodplains. 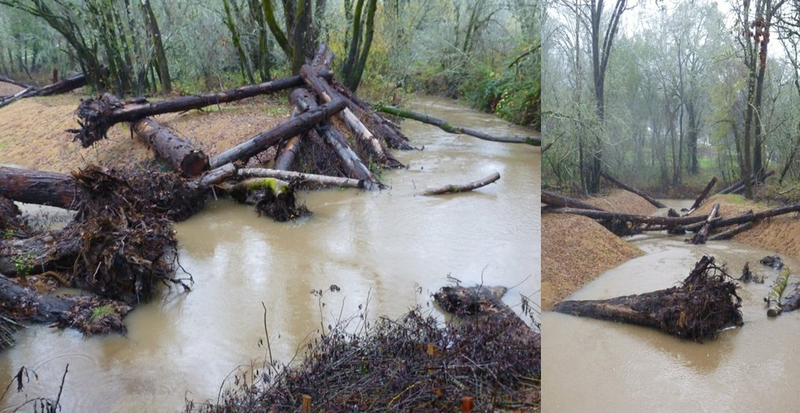 In an effort to address this concern, the Gold Ridge RCD, NOAA Fisheries, CDFW, Sonoma County Water Agency, California Coastal Conservancy, and local landowners partnered to implement a winter refugia, off-channel enhancement project on Green Valley Creek. In the fall of 2014, a seasonally-flooded side channel was constructed adjacent to the main stream and several large wood structures were installed to add complexity and shelter. CA Sea Grant's Russian River Salmon and Steelhead Monitoring Program used PIT-tag technology to evaluate fish use of the project reach before and after project implementation, in order to document the effectiveness of the enhancement project in providing seasonal refuge for juvenile coho salmon. A full discussion of monitoring methods and outcomes can be found in the Green Valley Creek Winter Refugia Enhancement Project Monitoring Final Report.